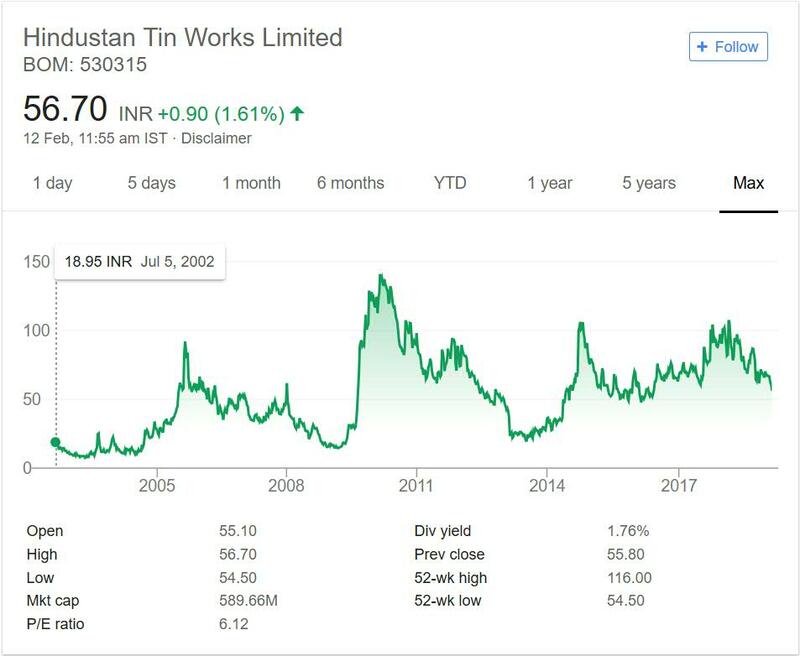 Hindustan Tin Works Ltd. is in portfolio of Subramanian P. He is one of the top investors in India. The company belongs to Packaging sector. As per the Company website it is one of the leading manufacturer and exporter of high performance cans, printed sheets,and related components to consumer marketing companies in India and abroad. The client base of the Company has some marquee name like Asian Paints, Amul, Bikanerwala, DS Group, Del Monte, Danone India, Haldiram, Nestle India Ltd, Patanjali and Reckitt Benckiser . It supplies diverse range of aerosol cans, food cans, beverage cans, baby food cans and can components to a wide variety of foods, beverages, baby food, health, beauty and luxury companies in more than 30 countries in Africa, Australia, Europe, Middle East, New Zealand, USA, and parts of South East Asia. The manufacturing plant is located in Sonepat Haryana. The registered office is present in New Delhi. If you closely see the long term chart then Company becomes good buy at price below 50 (most preferably 25 odd levels). Once it touches these levels it zooms past 100 levels giving you decent returns in the time frame. It also gives you good dividend. At current market price it gives more than 1.5% dividend. Any company paying good dividend is always plus point for investors. It does look very attractive looking at business but price performance numbers do not tally with that good story. Hindustan Tin Works limited is in packaging sector. It manufactures metal container for different industry products. The fortune of Company depends on two things. Both of them are related to plastics only. One is good and second is bad. First is companies are fast replacing metal containers with Plastics for packaging. This growing trend will impact core business of Company as it only deals with Metal containers. Second is growing awareness among Government and People not to use Plastics as they are not environment friendly. So far no one has banned usage of plastic containers but plastics bags are getting banned across India.There are campaigns on Plastics garage and its impact on environment. This will be good news for the Company. Any push to replace plastic container will propel the Company to new heights very easily. I will be tracking the Company to play any news or developments regarding the facts mentioned above. If that does happen then it will be interesting play. Note during Demonetization time TVS Electronics zoomed as it dealt with POS terminals.